This week, members of the SoxProspects.com brass are posting their end-of-season Top 40 rankings and answering some questions about their lists. We'll release our aggregate rankings on Friday as well, so don't worry if some of the player-specific questions about being high or low on players don't make sense yet. Up next, coming to you from across the pond in London, is Northeast Scout Ian Cundall. Describe the system/rankings in a haiku. I like both of them a lot, but both Owens' floor and ceiling are higher than Cecchini's for me. Owens' floor is a back-end starter, but he has the chance to be a very good mid-rotation type (number three starter) if everything comes together. With Cecchini, I have real concerns about how much power he will hit for, and at best he is an average defender at third base with a chance that he might have to move off the position, to either left field or first base. If Cecchini played up the middle it might be a different story, but Owens as starting pitcher with the chance to be a mid-rotation type is more valuable in my opinion than a corner position player with only one true plus tool. 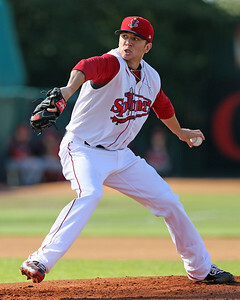 Pat Light was number 41 for me, and if he returns healthy and shows the stuff he did during his debut season with Lowell, when he was up to 97 with his fastball, with a slider and developing changeup, he will easily climb into the top 40.
Who did you think you were going to rank higher? Lower? Going into the process I thought I would have ranked Trey Ball a lot higher, but he had too many question marks for me to be comfortable ranking him ahead of guys I’ve seen and know like Teddy Stankiewicz. Ball has a great pitcher's frame and intriguing athleticism, but he still has a long way to go developmentally. He is someone I’m looking forward to seeing next year and could very well rise quickly in my rankings. Brian Johnson was someone who was initially down my list, but for the same reason that I didn’t rank Ball as high is I thought I was going to, I pushed Johnson up in the end. Johnson is what he is and doesn’t have much projection left. What he is, however, is a potential back-end starter who can eat innings, and in this day and age someone with that profile has value. Johnson didn’t have the type of season would would have hoped for a college guy starting in Low A, but he isn't that far behind the developmental curve after ending the season with Salem. Coming into the year we knew what he was and why he was a first-round pick, and little changed this year to make me think anything different. You were by far the highest on Corey Littrell. Why's that? At first I had Littrell much lower in my top 40, but the more I thought about it, I realized that was a mistake. While Littrell doesn’t offer much in terms of ceiling and his stuff doesn’t wow you, what he does offer is safety and a professional approach on the mound, which will serve him well as he progresses through the system. Littrell has good pitchability and a solid four-pitch mix that allows him to get both left- and right-handed hitters out and miss enough bats to potentially profile as a back-end starter if everything comes together. You were the lowest on Michael Almanzar. Why's that? 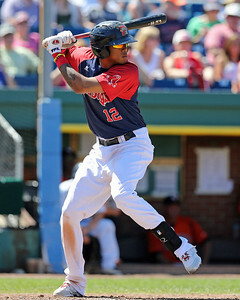 In hindsight, I probably have Almanzar lower than I should, but after watching him extensively this year and seeing him as he progressed through the system, I don’t see a major league player there. It's not because of a lack of talent, but more because of his approach to the game and effort level on the field. He definitely took steps forward in that department this year, but he is also still raw on the field with his approach and a below-average defender. He could play in the big leagues one day, I just don't see it happening with the Red Sox. Though he only threw a handful of innings this year, his combination of present velocity along with his upside was too much to pass up, and he’s someone I could see rising in the rankings if he comes out and performs well next year. He has a loose, live arm and the potential for a plus-to-better fastball/slider combination that at worst could play out of the bullpen, but that would only be a last resort as he will develop as a starter a la Drake Britton. Pick one guy on the list and talk about why you ranked him where you did. 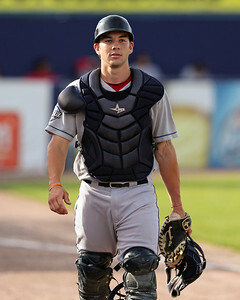 In somewhat of a surprise even to myself, I settled upon Blake Swihart at the number four spot. Coming into the season, I had questions about his long-term position whether he could stay at catcher, where his tools profiled best. He put any talk of a position change to bed with his season this year, as the defensive reviews were very favorable and he took a step forward at the plate showing an improved approach and a solid hit tool from both sides of the plate. Though he doesn’t have much power projection, the rest of the package is all there and a catcher with his combination of offensive and defensive ability is extremely valuable. He is likely to start in the upper minors with Portland next year with the potential to debut in the big leagues sometime in 2015, which only adds to his value.